Meeting other coin collectors is important to anyone wanting to be successful in the coin collecting hobby. Books, Magazines and the Internet are all good sources of information, and reading and studying information from all these sources is highly recommended. So the sources we will discuss in this section are not a replacement for these, but rather an extension to your learning experience. When you are just starting a coin collection, nothing beats first-hand, live, in-person mentoring from seasoned successful coin collectors. Someone who has been where you are now and are ready and willing to pass on their experience to newcomers to the hobby. But don't worry, most coin collectors are a lot like fisherman. They love to talk about (and brag about) their coin collecting experiences. Here are a few places you can meet coin collectors and learn more about the hobby. Join a local coin club in your area. They are a great source of information and inspiration. Most coin clubs meet a couple of times a month and offer coin collectors a variety of activities, including educational programs on various numismatic subjects. It is quite common to have bourse or auction night where members can trade, sell or buy coins from each other. "Show and Tell" is also popular with coin clubs as well as programs for young collectors. Check your local yellow pages or ask your local coin dealers to find one near you. Local coin dealers are a great source of information. Find one near you that is reputable and knowledgable and willing to share that knowledge with you. Just keep in mind that just because someone claims to be a coin dealer, it doesn't necessarily mean that they are experts. They may not know any more than you do about collecting coins. Members of local coin clubs will know which coin dealers in the area are reputable. The coin dealer will more than likely be a coin club member too. When a coin show comes to a city near you, make a point to go. The people who attend these shows all have one thing in common - coins. You will also see some really interesting coins. Coin Shows are often organized and promoted by local coin clubs or by a commercial show promoter. They are usually held on weekends and sometimes a small entrance fee is charged, but it is usually just a couple of dollars. Coin Shows offer coin dealers, coin collectors and the general public an opportunity to buy, sell and trade coins and other numismatic items, and many offer educational programs taught by experts on various numismatic subjects. If you plan to sell a coin or coins, do your research ahead of time and have a good idea of what your coin is worth, but don't expect to get full catalog price. The dealer will need to make a profit when he resells the coin. If you plan to buy coins, it is also very important to do your research ahead of time and don't buy the first coin you see. Visit several different coin dealers' tables before you make your choice. Coin Exhibits are also often on display at coin shows and offer the novice coin collector a glimpse at rare and valuable coins that you may never get the chance to see again. 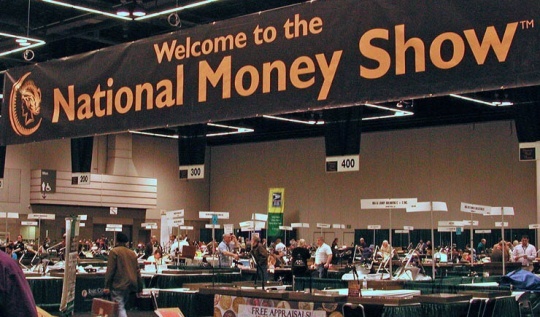 Click Here to find out when a coin show will be in your area. Note: Once again I refer you to that saying that is so popular with coin collectors - "Buy the book before you buy the coin." Do your research before you buy or sell any coins. Be sure to attend the educational seminars that are presented at these coin shows. These seminars are presented by experts and you will find a wide variety of topics discussed. You will usually even have a chance to ask the expert questions after the seminar. Each summer the ANA holds two week-long summer seminars at Colorado College in Colorado Springs across from its headquarters. They offer courses for people just starting a coin collection as well as more advanced courses. Courses range from "Adventures in Numismatics and the Sights of Colorado Springs" for beginners to "Advanced United States Coin Grading and Problem Coins" for the more seasoned coin collectors. They also offer the "Coins in the Classroom" course for teachers which teaches them how to incorporate coins into lessons in social studies, math and other subjects. To find out more information about these classes visit the American Numismatic Association (ANA) website.